I recently installed the latest stable release of Opera (v46) on my PC (Windows 10) and I noticed that the font aliasing issue from years ago is still around. The most obvious place I spotted these font issues are right here on the Opera Discussion boards. 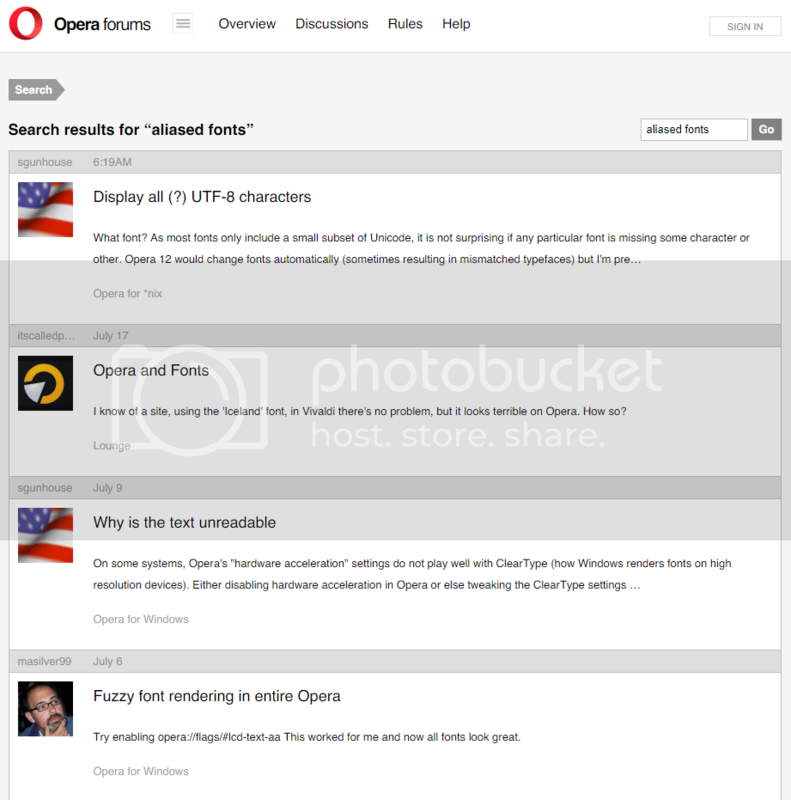 As in the screenshots, the fonts in Opera look crooked and aliased. It's most obvious in characters s, p, and o, which show jagged edges. I have tried several proposed solutions, including using the experimental flags, to no avail. I really want to use Opera as my main browser but reading on it is unbearable because of these issues. I am seeing this same issue, however it is limited to fonts that I have installed on my local system. Fonts that I do not have locally installed are getting anti-aliased just fine but fonts that I have installed on my PC are not being anti-aliased. I have tested this with several different font families and the behaviour is consistent. I too have tried all of the flags as well as purging my browser settings. The only thing I haven't tried yet is reinstalling, however I am seeing this behaviour across multiple devices.